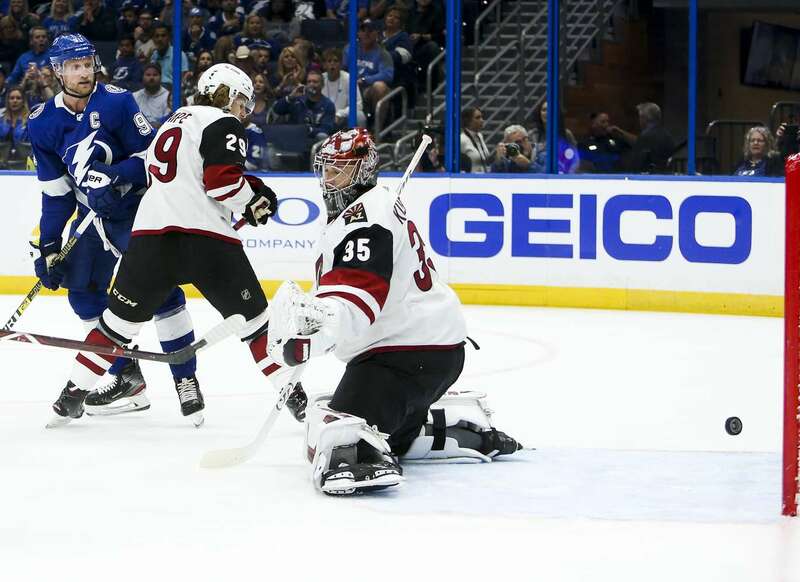 DIRK SHADD | Times Tampa Bay Lightning center Steven Stamkos (91) beats Arizona Coyotes goaltender Darcy Kuemper (35) to score he first goal of the game and sets the Lightning franchise goal record with his 384th career goal, during first period action at Amalie Arena in Tampa, Monday evening, March 18, 2019. Lightning center Steven Stamkos (91) celebrates after he beats Arizona Coyotes goaltender Darcy Kuemper (35) to score and set the Lightning franchise goal record with his 384th career goal. Lightning center Steven Stamkos (91) celebrates with center J.T. Miller (10) after he beat Arizona Coyotes goaltender Darcy Kuemper (35) to score and sets the Lightning franchise goal record with his 384th career goal. Lightning center Steven Stamkos (91) celebrates with his team at the bench as he sets the Lightning franchise goal record with his 384th career goal. Stamkos is congratulated by head coach Jon Cooper on the bench. Stamkos waves to the fans after scoring as they announce him setting the Lightning franchise goal record. The locker room doors remain shut before the Lightning prepares to head down the tunnel for warmups. Lightning center Tyler Johnson (9) prepares to head down the tunnel for warm ups. Lightning defenseman Victor Hedman (77) before warmups. 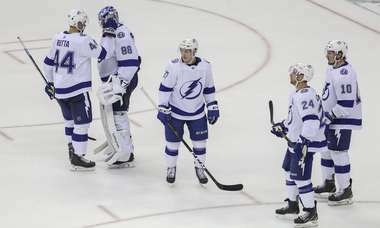 Lightning defenseman Victor Hedman (77) stands in the center of the hallway as the team prepares for warm ups. Lightning goaltender Andrei Vasilevskiy (88) heads down the tunnel and onto the ice for warm ups. Lightning center Steven Stamkos (91) steps onto the ice for warm ups before taking on the Arizona Coyotes at Amalie Arena in Tampa, Monday evening.